Whitman currently supports both EndNote X7 and EndNote X8. However, Clarivate is introducing EndNote X9 soon, so full support for EndNote X7 may not continue. For example, you can no longer set up a sync of EndNote X7 on your computer with EndNote online (although if you had set up a sync before January 2018, it should still work). Unless you have specific reasons to install EndNote X7, it probably makes sense to choose EndNote X8 if you are setting up a new installation. The direction of the slashes is important for Mac vs. Windows! There is a knowledge base article on connecting to a network drive. EndNote is a software tool that can help you collect, manage, and cite your research sources. There is a basic free version that functions in the cloud (and, specifically, within Web of Science), and a more extensive licensed version for a desktop. EndNote can be integrated with Microsoft Word. Whitman has a site license for EndNote 7 and for EndNote 8; you may use the licensed version of EndNote while you are a student, faculty, or staff member, but after leaving Whitman you will need to purchase your own copy. For more information on installing EndNote, see the EndNote box to the left. EndNote has a number of screencast guides that explain the basics of using the software. For EndNote X7, there are Quick Reference Guides (for Windows, Mac, and online versions) and also a Getting Started Guide that explains some basic functions, and a complete User Manual. Similar reference materials are available for EndNote X8. 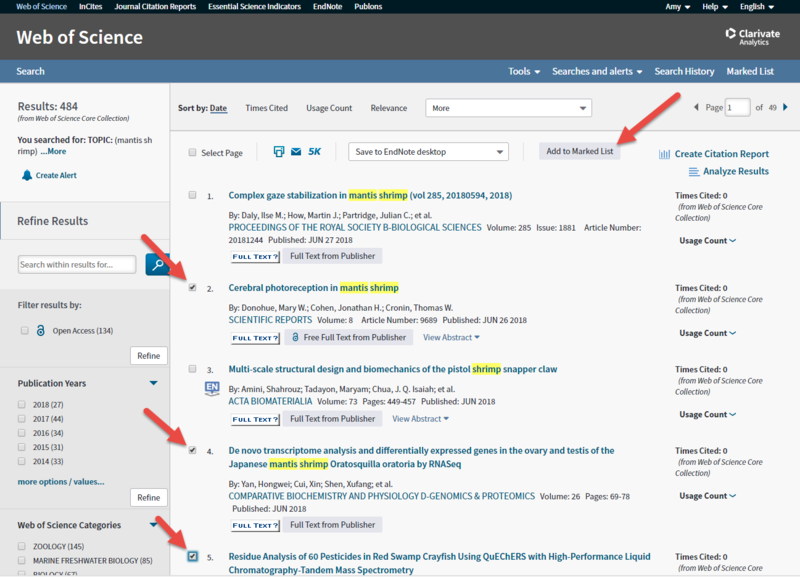 To get started using EndNote, you need to create a basic online account (within Web of Science or at myendnoteweb), or download the software to your computer -- see instructions to the left. It is important to remember that the information you save into your desktop EndNote library, just like any other documents you save onto your hard drive, needs to be backed up. It is generally good practice, recommended by WCTS, to back up your entire hard drive periodically. However, you can also back up your EndNote library in a compressed file (watch a video or read how online). This is especially important if you are using EndNote over the course of a longer research project, like a thesis. You can sync your desktop EndNote library to an online version, but you should not look at this as a backup option, because there is also potential for you to lose information in a sync. 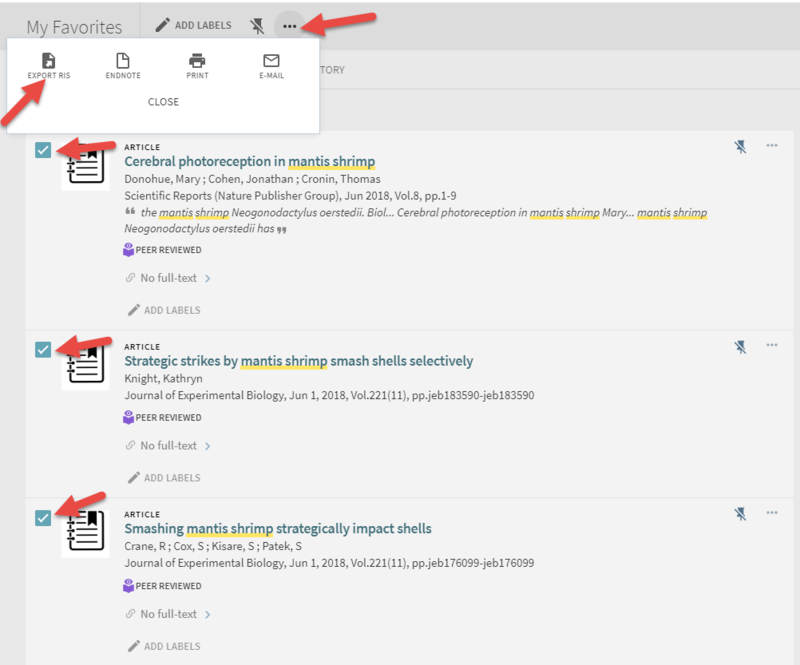 Both EndNote and Zotero are citation managers that save bibliographic data, store PDFs, and integrate citations and bibliographies into Microsoft Word. There are advantages (and potential disadvantages) to each system. 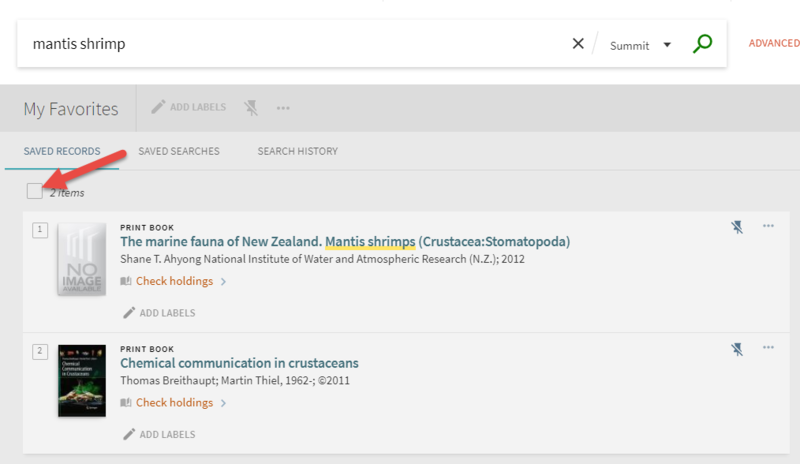 If you do a lot of searches in Web of Science, or if you will access a citation manager only from the internet rather than from your own computer, EndNote may be a good choice for you. To learn more about Zotero, see our Zotero guide. 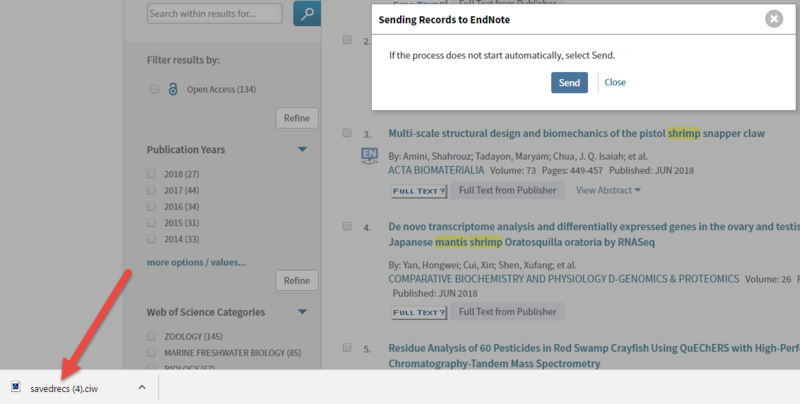 Because EndNote is integrated into Web of Science, it is very easy to get citation information from Web of Science into EndNote. 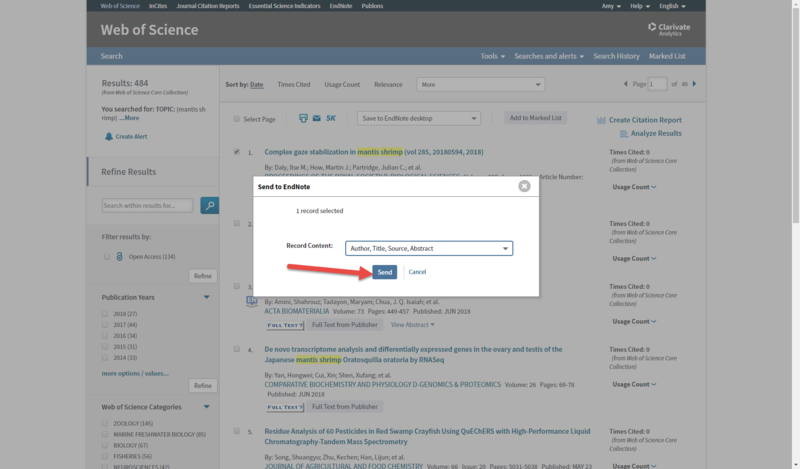 If you sign in to your online EndNote account from the Web of Science interface, you can add references to your library by checking the box next the references and clicking "Save to EndNote online" from the dropdown menu. Any references that you have already saved to your online library will have a blue EN next to them. To save records directly to EndNote on your desktop, choose "Save to EndNote desktop" from the dropdown menu. A dialog box will pop up asking what you want to do with the exported file. 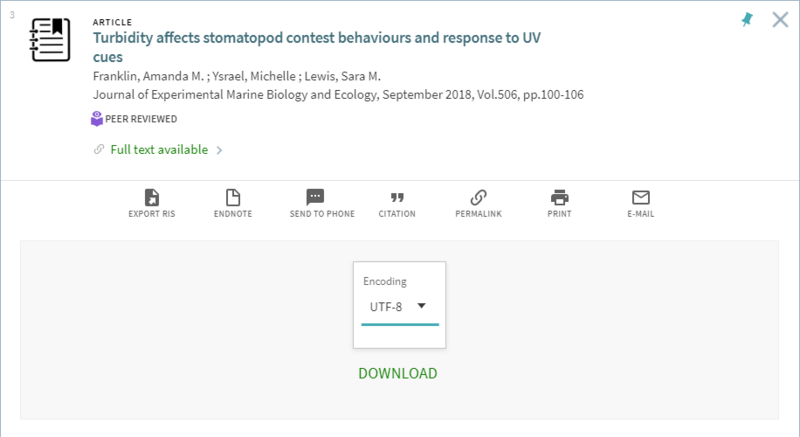 Choose the record content you want, click on "send", then click on the downloaded file information at the bottom of your screen. There is another method to save records to EndNote online or desktop. Check those records that you want to save to EndNote, and click on the "Add to marked list" button. Then click on the Marked List tab. Above the list of records that you have marked, you will see a menu that lets you choose how to save them -- to EndNote online or EndNote desktop. You then continue as described above. You can save bibliographic information directly from Sherlock to your EndNote online account. 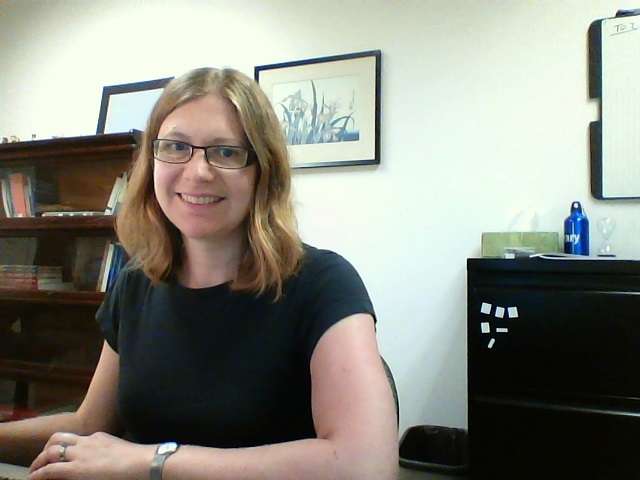 It is easiest if you are already signed in to EndNote online in the same browser. For more information on signing in to EndNote online, look here. O1. The quickest way to save to EndNote is to click on the three dots in the upper right corner of the record in the list of results. This will open a box with various commands. Click on "EndNote." O2. In EndNote online (assuming you are logged in), you will see that a record was imported. 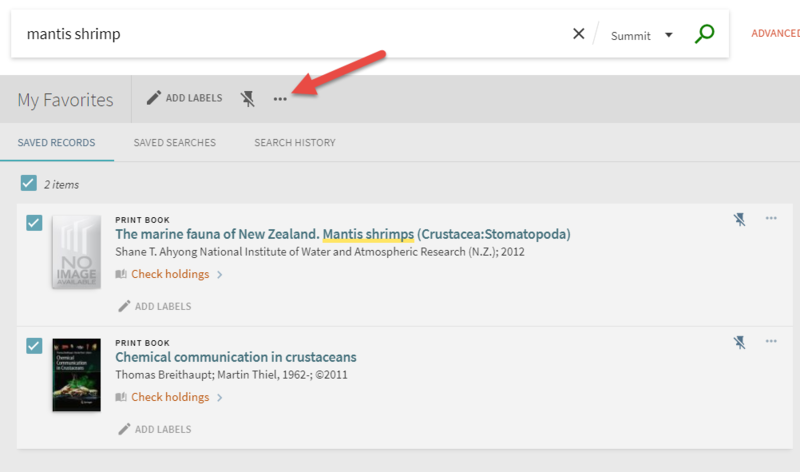 When you navigate to your list of references, the new citation will appear. O3. To save more than one record at a time, save all of the records you want to put into EndNote in your "my Favorites" (by clicking the pin next to the title in the Sherlock search results list). Then go to your my Favorites page and select all of the records you want to put into EndNote. O4. 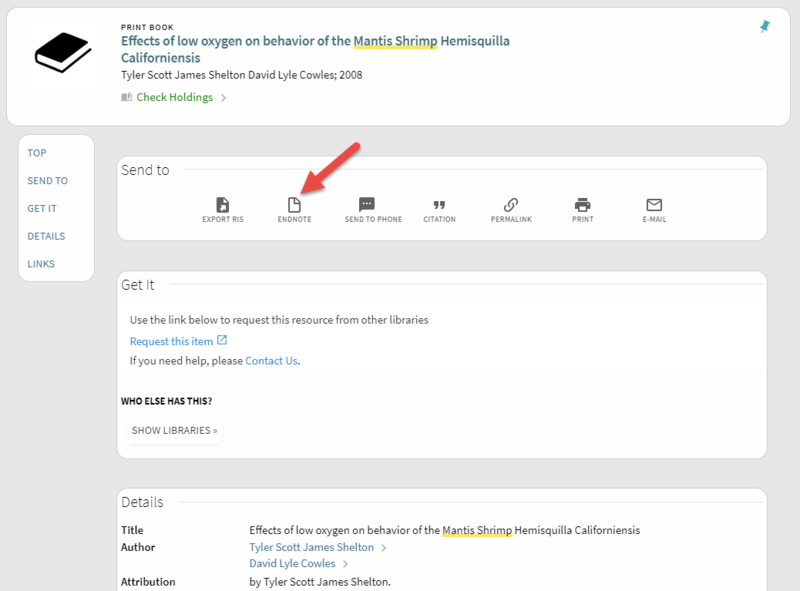 Click on the three dots to get to the Actions menu, then click on EndNote. You will be prompted to log into to EndNote online if you are not already logged in; then your records will be imported and you will see a message that tells you how many records were imported. 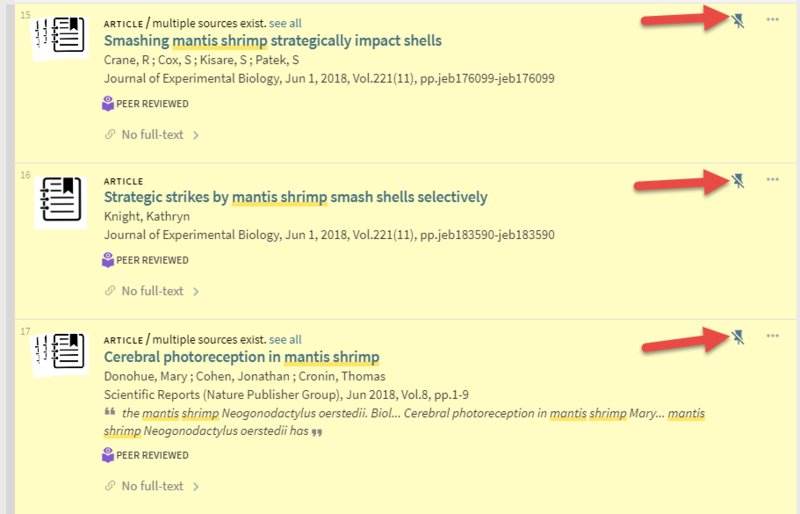 When you navigate to your list of references, the new citations will appear. Saving bibliographic records from Sherlock directly to your desktop EndNote is also possible (but a bit more complicated). D1. In the Actions menu (click on the three dots in the upper right corner, or open the record by clicking on the title) for the record you want to save, click on Export RIS. When prompted, click on Download. D2. The file with the citation information will be in your downloads folder. 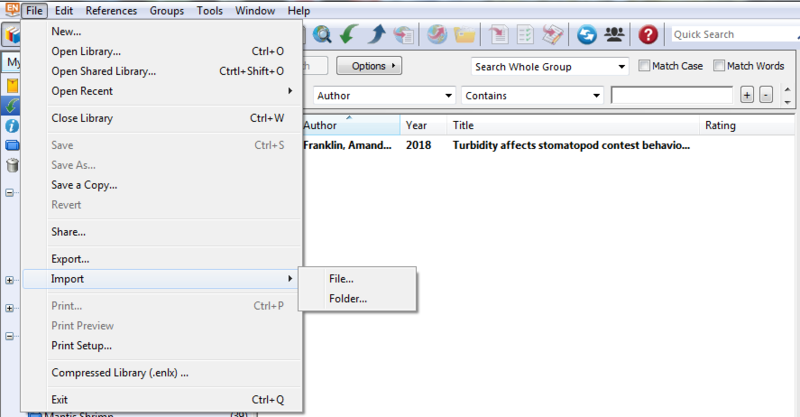 In EndNote, under the File menu, select Import File. 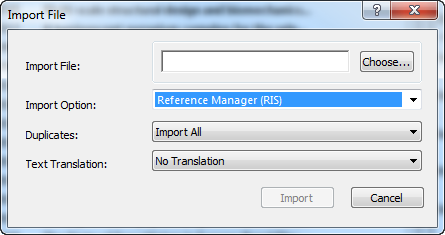 In the dialog box that opens, select the RIS file, choose Reference Manager (RIS) for Import Option, and click on Import. D3. The citation has been imported into the desktop references. D4. 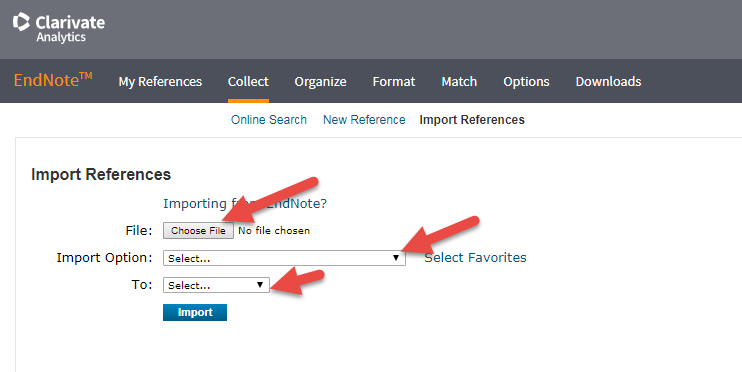 You can export more than one reference at a time to your desktop EndNote as well. Save all of the records you want to put into EndNote in your my Favorites (by clicking the pin for each title in the Sherlock search results list). Then go to your my Favorites page and select all of the records you want to put into EndNote. D5. Next, click on the three dots at the top of the my Favorites menu, then click on "Export RIS" and then on "Download." 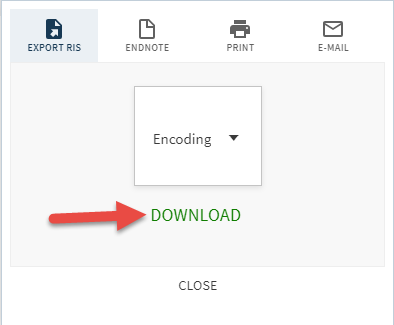 An RIS file should be saved to your downloads folder. 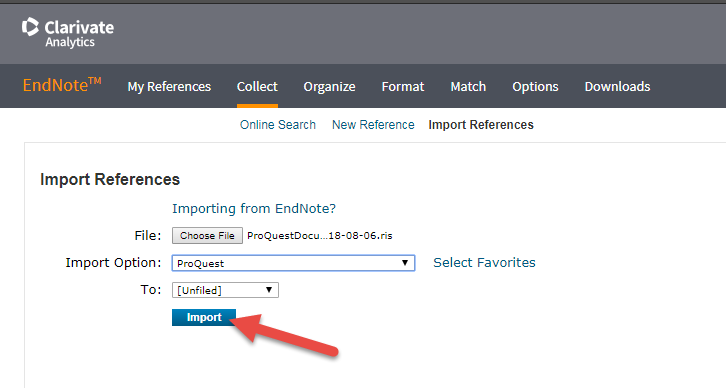 To export from a ProQuest database into EndNote desktop, from your results list, select the references that you would like to export to EndNote. Then from the menu at the top right of the results list, choose Save, and click on "RIS (works with EndNote, Citavi, etc.)" on the pull-down menu. You will see the following dialog box (this one indicates that 2 items were selected). Click on "Continue." From EndNote on your desktop, import the RIS file. 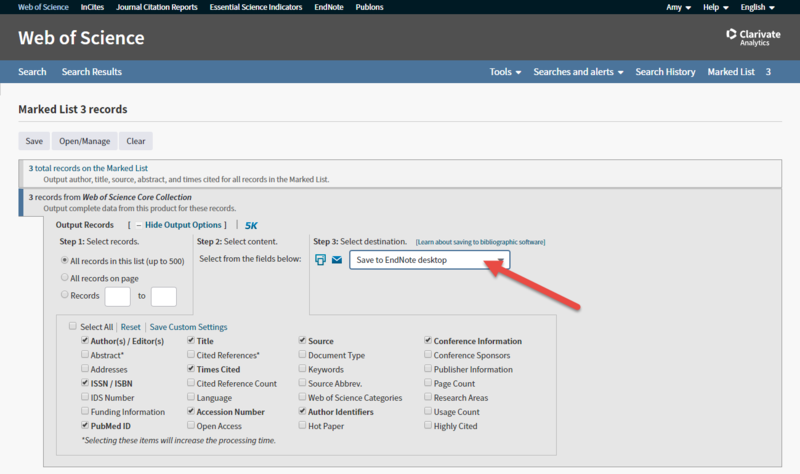 There is a way to import ProQuest references into EndNote online, but it has a few more steps. 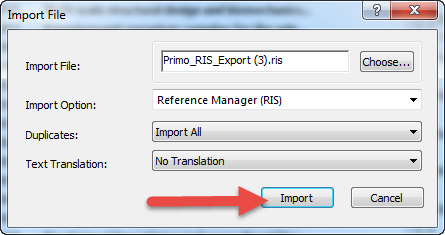 As above, select the references you wish to import, and choose RIS from the More pulldown menu. In the Export/Save dialog box, click on "Continue." The file should save in your Downloads folder (unless you specifically indicated a different place to save it). 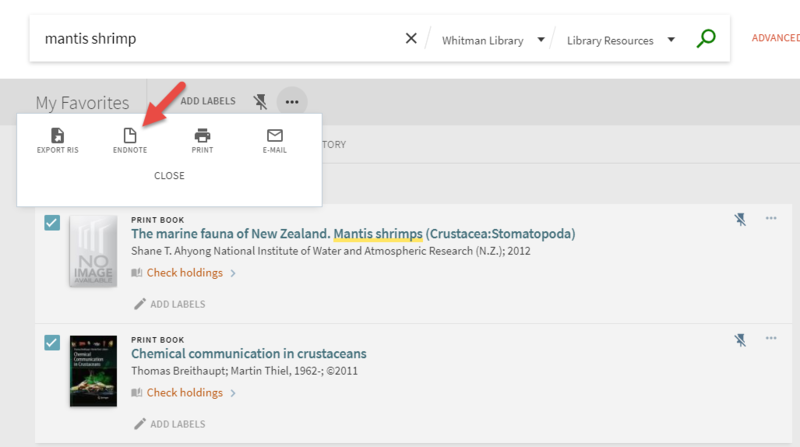 Next, from the online EndNote interface, click on the Collect tab, and then click on Import References. Now, choose ProQuest from the Import Option dropdown menu, choose the EndNote group you want to put the references in from the To: dropdown menu ([unfiled] is fine, you can move it later), and click on the browse button and choose the file you downloaded previously (probably it's at the top of your Downloads menu). Once you have the file, the import option and the destination filled in, click on "Import." Now if you click back to the My References tab in EndNote, your new references should be there. Consider going through these steps for longer lists of citations -- if you only have one to enter, it's possible it would be faster to enter it by hand! Many databases will have an option to export RIS (a file of citation information). 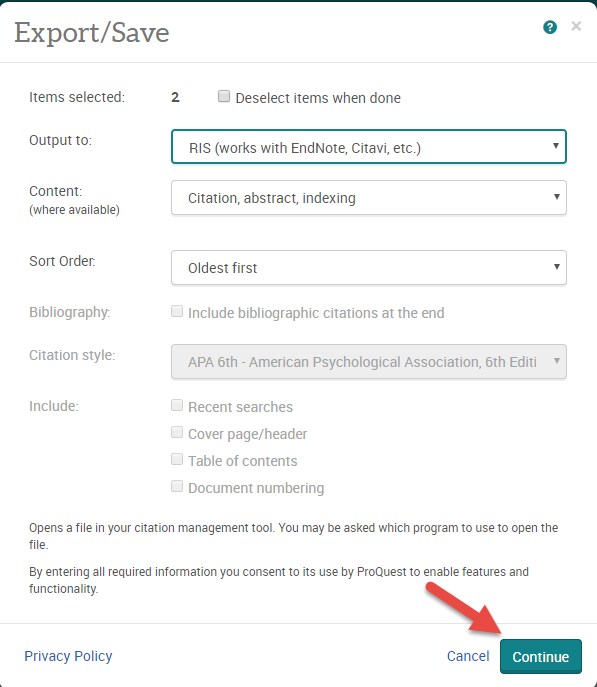 The procedure to add an RIS file to EndNote online or to EndNote desktop will be essentially the same for other databases as for the ProQuest databases above. For guidance on working with your libraries, using "cite while you write," and generating bibliographies, see the EndNote quick reference guides for Windows X7, for Windows X8, for Mac X7, for Mac X8, or for the online EndNote. 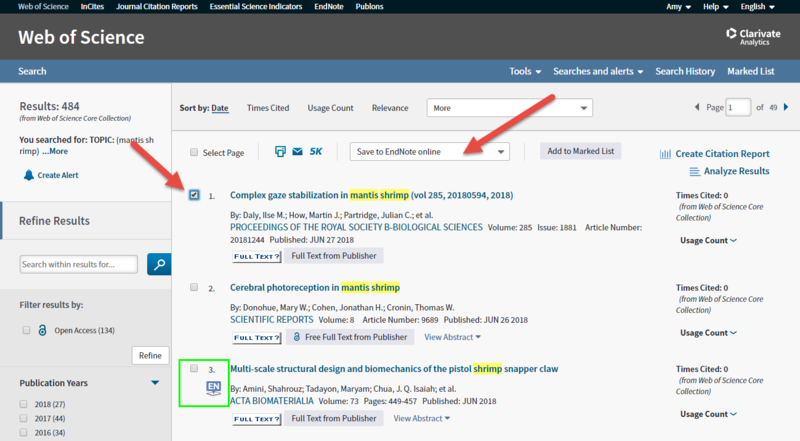 You can find more resources at the Clarivate EndNote website, such as how-to guides, manuals, and FAQs for EndNote X7 and X8. Or check out the training videos. Backing Up Critical Files suggests methods by which to back up individual files. Backing Up Everything on Your Hard Drive suggests methods by which to back up the full content of your computer's data. Regardless of how or where you choose to back-up your data, keep these notes in mind. Save early. Don't wait until next week to start backing-up your data. Take a little time now to set up your backups, and save yourself a massive amount of potential grief later. Save often. A month-old backup may be better than nothing, but it won't save you much grief. A week-old backup is pretty good, but a lot can happen in a week. A day-old backup means that, at most, you'd lose a day's worth of work should the worst happen. The more up-to-date your backups are, the better. Automate. Make your computer do as much of the work for you as possible. If you have to perform a backup yourself, you will likely forget at some point. This is when Murphy's Law will manifest. The less your backup procedures rely on you do something yourself, the better. Test your backup. A corrupted backup is just as useless as no backup at all. Periodically check your backups to make sure file corruption isn't sneaking into your safety net. More backups are better than fewer backups. Don't place all your trust in a single backup system. Back-up your files to multiple locations. If your hard drive dies and your main backup fails, make sure you have a secondary fall-back for at least your critical data. You should never, ever keep all of your eggs in one basket. Depending on your budget, the amount of data you have, and other details specific to you and your system, not all of these points may be possible. But the more that you are able to do, the safer your data will be.